Non-verbal reasoning tests are psychometric examinations of your ability to visualise patterns, shapes and formations. The tests are specifically based around your ability to solve problems using pictures, rather than words. They are used by employers to determine which candidates have high levels of critical thinking, logical ability, mathematical ability and powers of deduction. In this blog, we’ll show you exactly how to pass non-verbal reasoning tests. Determining how a shape will look if it is rotated by a certain degrees. The majority of questions will have 3-5 shapes from which you must select your answer. 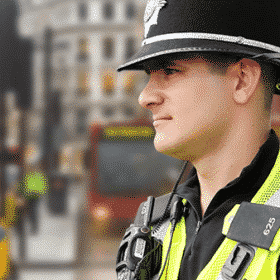 For many people, non-verbal reasoning tests can be extremely intimidating. They are unprepared for the difficulty of the assessment, and as a result they fail the examination. The best way to pass the non-verbal reasoning questions is through practice. If you take as many practice questions as you possibly can, you will familiarise yourself with the process, and will be ready for anything you that might encounter in the exam. In order to pass non-verbal reasoning tests, you need to remain calm and logical under pressure. The more relaxed you are, the easier this will be. If you are struggling with a particular type of question, then move on and come back to it at the end. Below we have listed a number of sample questions, to give you a better idea of what you should be looking out for in non-verbal reasoning assessments. Explanation: The question asks us to look at the shape top down. From the top down, we would only see a flat, horizontal column of squares. Therefore, the answer is B. Top Tip: Only focus on the shape that would appear on the top of the diagram. (Shown by the red circle in the example). 2. Look at how the figure changes from box 1 to box 2. Apply the same changes in order to get the correct answer. Explanation: In the first shape, each of the lines in the corresponding square is doubled. For example, the first box contains 1 line, and this is then doubled to make 2 lines in the corresponding box. Therefore we need to apply the same rule to the rectangle shape. Answer B represents what the rectangles would look like if all of the lines were doubled. Top Tip: Focus on one element of the diagram. What happens to it from box 1 to box 2? 3. 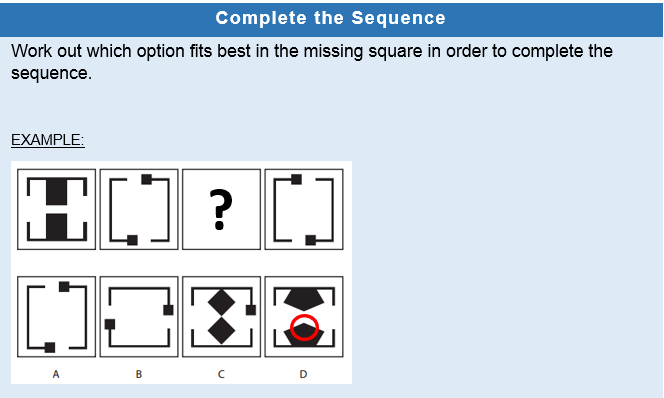 Work out which option best fits in the missing square in order to complete the sequence. Explanation: In this sequence, the first box can be related to the third, and the second with the fourth. Therefore, our answer cannot be A or B. If we compare C and D, C has an out of place square on the edge of the diagram and both of the shapes in the middle are touching. 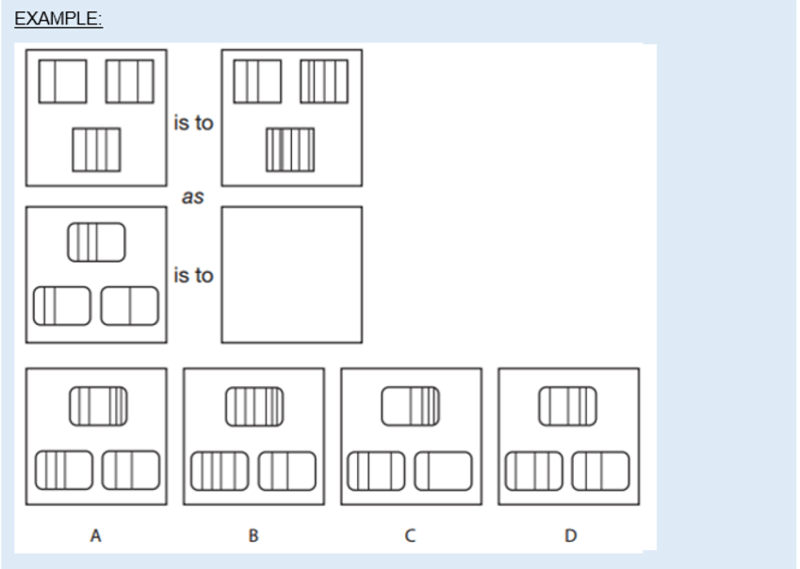 Answer D has the closest similarity with the first box. Therefore, the answer is D.
Top Tip: Eliminate the obscure answers, so that you are only left with answers that could be right. For hundreds more sample questions, answers and fantastic tips, please purchase our essential guide to Passing Non-Verbal Reasoning Tests. This entry was posted in Career Videos. Bookmark the permalink.